The App object is the basis of all GUIs created using guizero. It is the main window which contains all of the other widgets. bg color None No The background colour of the app window and widgets inside it. Takes a color value. height int 500 No The height of the window in pixels. title string "guizero" No The title displayed in the bar at the top of the window. width int 500 No The width of the window in pixels. visible boolean True No If the App should be visible. You can call the following methods on an App object. add_tk_widget(tk_widget, grid=None, align=None, visible=True, enabled=None, width=None, height=None) tk_widget (tk), grid (list), align (str), visible (bool), enabled (bool), width (int), height (int) Widget Adds a tk widget into a guizero container. Note - this is an advanced feature see Using tk for more information. display() - - Displays the app on the screen. You MUST call this method at the end of your program to display the app on the screen. hide() - - Hides the app window from view. on_close(command) command (function name) - Calls the given function when the user tries to close the window. update() - - Force the application to update itself, useful if changes aren't reflected in the UI. Refer to a property as <name of widget>.property. For example, if your App object is called app you would write app.title. You can set the property (for example app.title = "Hello world") or get the value of the property to use (for example print(app.title)). Create an App object by calling the App() constructor. You should give the object a name so you can refer to it later - in this case we have called it app. It is best to keep the name you give to your App object quite short, as you will have to use it to tell other widgets where they should be stored. At the end of the program you MUST tell the app object to begin the display loop. 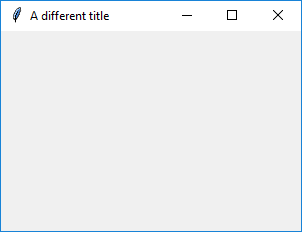 app.title = "A different title"